What Can I Do to Maintain My HVAC System? Historians might say that literacy, democracy or educational systems are the hallmarks of civilization. If you live in California’s Coachella Valley, you know that air conditioning is what truly makes life civilized. Keeping cool in this hot region, especially in the summers, is a necessity, not a luxury. You can’t afford to go even a day without proper AC. Put these tips for air conditioner maintenance to work in your home to keep your living space cool and comfortable. You might not be a mechanic or a technician, but did you know that there are many things you can do on your own that prolong the life expectancy of an air conditioner? Each of these tips details a task that’s easy to do and which improve the day to day function of your air conditioning unit. No, seriously. Taking care of your lawn, especially where it grows around the exterior portion of your AC unit. Grass and leaves can clog up the exhaust. Blocking the flow of hot air as it comes out of the house causes your machinery to run hotter. This wastes energy and puts undue stress on the HVAC pump. Heat buildup wears the mechanical components and can lead to early breakdown. Your HVAC’s filters catch airborne particles and keep them from flying around the room. Over time these filters get loaded up with matter. If you let this go on it restricts air flow and keeps the cold air from getting where you need it. An average filter lasts for only up to three months. If you check it once a month you know exactly when it’s time to replace them. Installation takes just a couple seconds. You can get a standard air filter at your local hardware store. The ductwork in your home is the conduit through which air flows. Dust bunnies, spider webs and other particles and deposits build up over time. This has the same effect as a clogged filter. It’s also a fire hazard. Use a simple shop vacuum or flexible hose attachment to reach as far as you can into the ductwork. You’ll have to pop off the register grilles to access the interior. While you have the grills open, make sure to clear them out. Set aside some time for grill and duct cleaning when do your monthly filter change. Besides regular maintenance there are a few other things that you can do to ensure that your air conditioner is running more efficiently. As pleasant as it is to enjoy the sunny view from inside your home, letting in the sun’s rays is a bad idea. Solar radiation entering through the windows heats up the interior of your house.If you turn the shades to keep out the light, you also prevent the temperature from rising. If you need some light inside, opt for LED bulbs. These energy-efficient models are shed less heat energy than incandescent or compact fluorescent bulbs. They also have the added side benefit of lowering your electrical bill due to lest energy consumption and they last much longer. During the day try and keep the doors in your rooms closed. This prevents the cold air from escaping from the room you’re currently sitting in. There’s no need to cool down the hallway or the laundry room if you don’t plan on spending any time there during the day. If you can get by comfortably at 70 degrees instead of 60, consider setting your thermostat to that temperature. Slightly warmer running reduces the load on your HVAC unit. It also saves you extra money on the electric bill every month. Try installing a smart thermostat. You can program it according to when you’re home during the day, your comfort preferences and other criteria. Smart thermostats regulate the performance of a heating and cooling system far more efficiently than making periodic manual adjustments. Besides reducing your energy consumption again, it asl minimizes the strain on your HVAC’s motor, thus extending its overall lifespan. You can also take some of the burden off of the air conditioner at certain times of the day. If youv’e got the room to a level that’s comfortable, try switching off the AC for a bit and turning on your ceiling fan or an oscillating fan. This keeps the cold air circulating for a while and gives you a pleasant breeze effect. When it starts to warm up again you can reactivate the air conditioner. There are a thousand things that can go wrong with an HVAC system. Here at Desert Air Conditioners, Inc, we’ve seen them all. In business since 1954, our roots in the community go deep. We understand your need to stay cool in the warm season. When something breaks, make us your first call. We come promptly and make sure that repairs get done right the first time. You can even opt to join our special Service Plan. This maintenance contract designates you as a priority customer. Whenever a problem comes up, you can call us and jump to the front of the service queue. Besides emergency jobs, we also make time to come and perform regular preventative maintenance and test that your equipment is running smoothly. With proper attention and care from our expert team, you can go many years without a breakdown. Don’t let a breakdown ruin your summer. Take care of your air conditioning equipment by means of regular preventative maintenance. 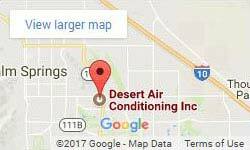 If worst comes to worst, call Desert Air Conditioners, Inc. We’re your local, trusted experts when it comes to air conditioning installation and maintenance. Use the contact form on this site or give us a call to get it taken care of today. What Causes an Air Conditioning Freeze Up?